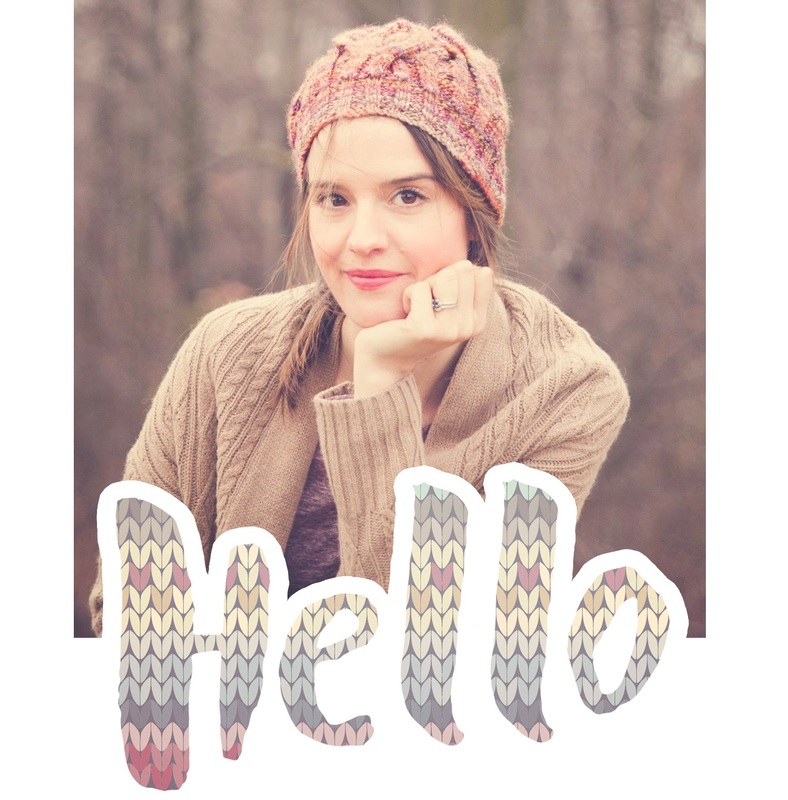 Oh, my poor neglected blog! 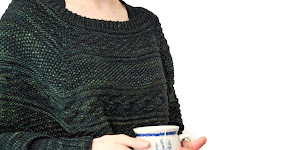 I’ve managed to finish a few small projects since January - including a new baby cardigan pattern - and I truly do plan to catch up in the next few posts. 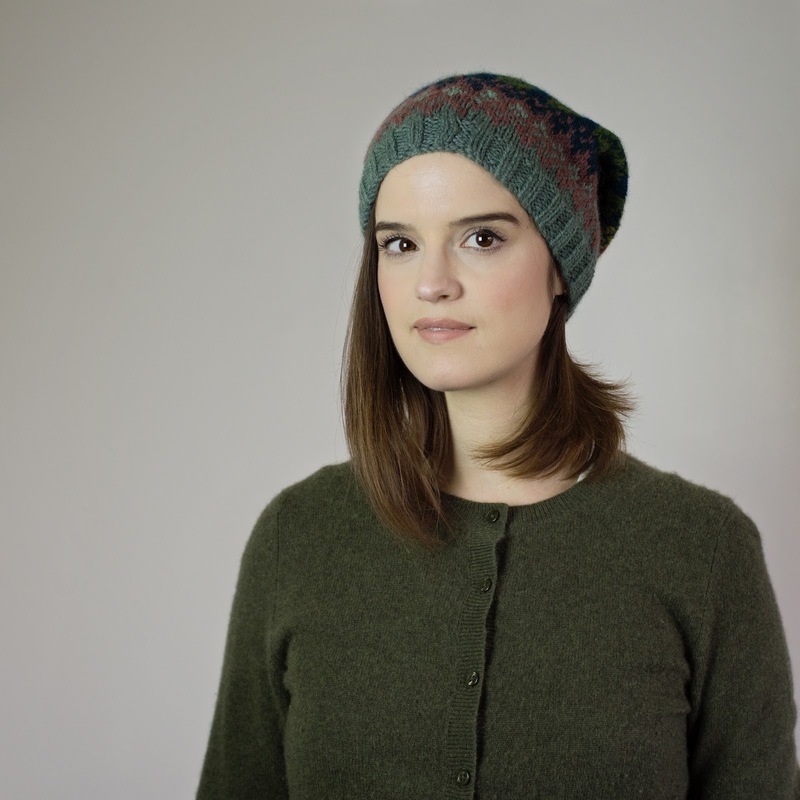 In the meantime, here’s a free slouchy hat pattern as a token of my guilt - I mean, gratitude :) I’d hoped to share this pattern on Canadian Thanksgiving but once the shorter hat was finished I was unhappy with the poor contrast/visibility of the colourwork (sound familiar? I still need to work on grasp of hues and values). 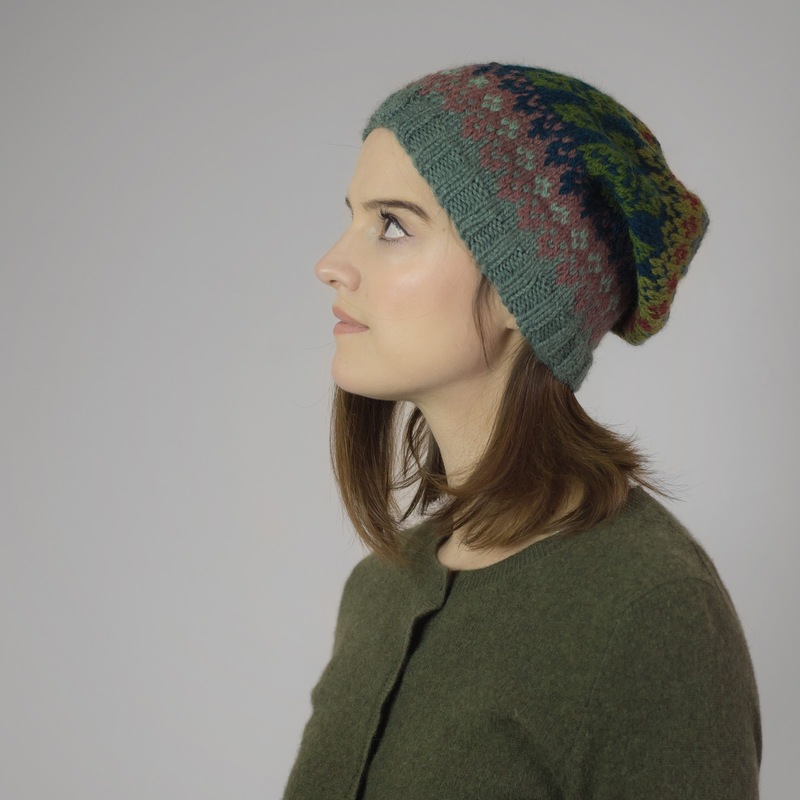 But honestly, it’s just a free little hat pattern, a small thank you to you lovely fellow knitters, so why stress about it? And if you’d like to give back, please consider making a small donation to your local food bank, soup kitchen or women’s shelter. Thank you! Ouf, je crois que 8 mois sans billets de blogue… c’est un nouveau record. Pourtant, j’ai bien réussi à compléter quelques petits projets depuis janvier! Je compte me rattrapper dans quelques semaines mais en attendant, voici un petit patron gratuit en guise de remerciement pour votre patience. En fait, j’aurais voulu le partager lors de l’Action de grâce, mais j’ai été déçu de la faible visibilité de la tuque aux tons gris. 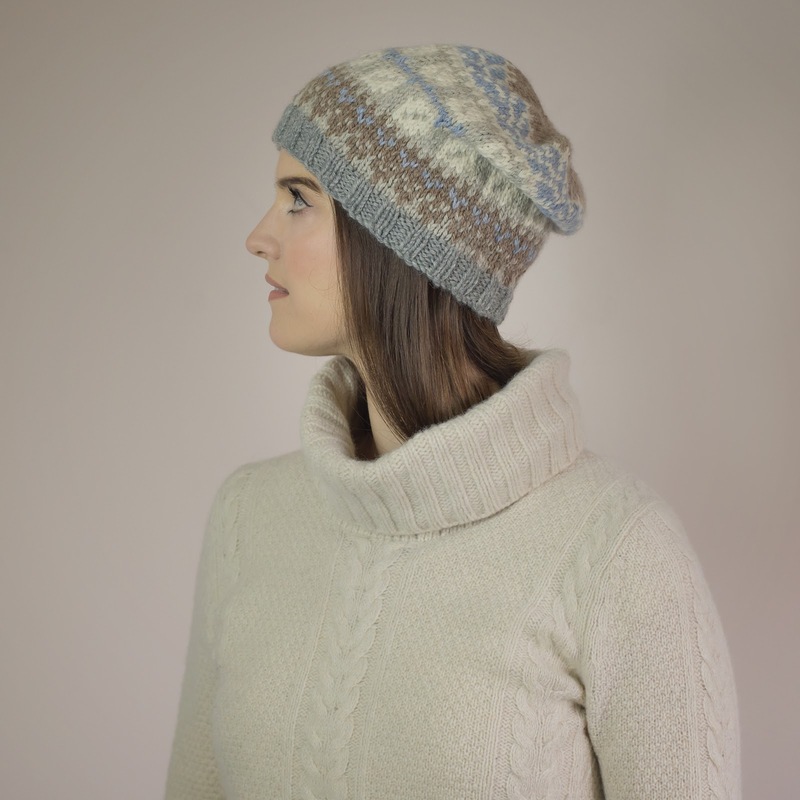 C’est hallucinant comment j’arrive à constamment ruiner les fair-isle avec mes choix de couleur! Mais en fin de compte, pourquoi stresser pour un tout petit patron gratuit? Alors le voici, en anglais. Si quelqu’un veut s’aventurer à le traduire en français je serais prenante! Fits average adult. 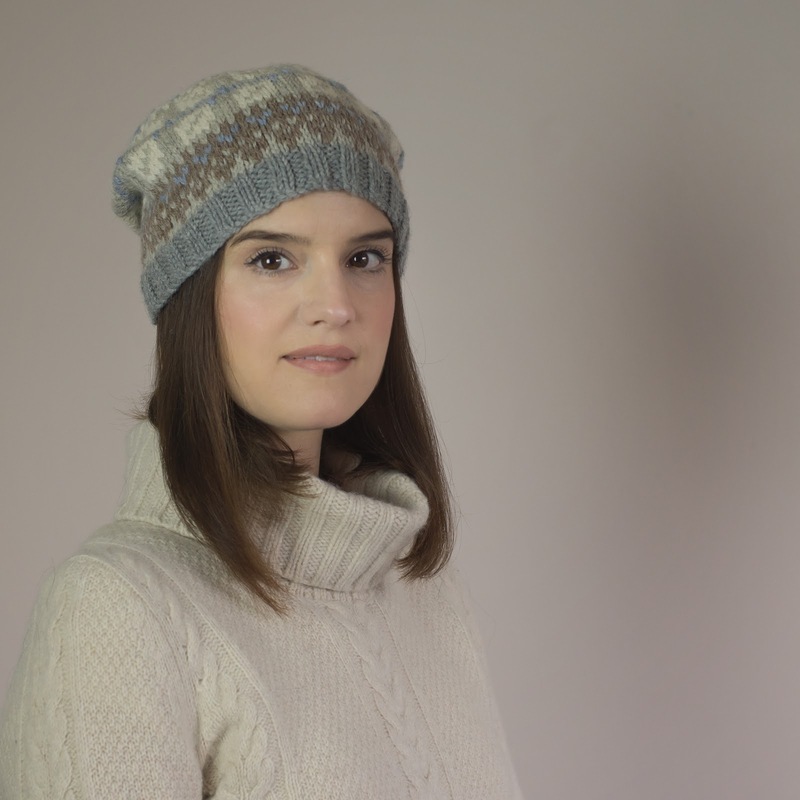 Hat measures 9.5" in (24cm) diameter at ribbed brim. 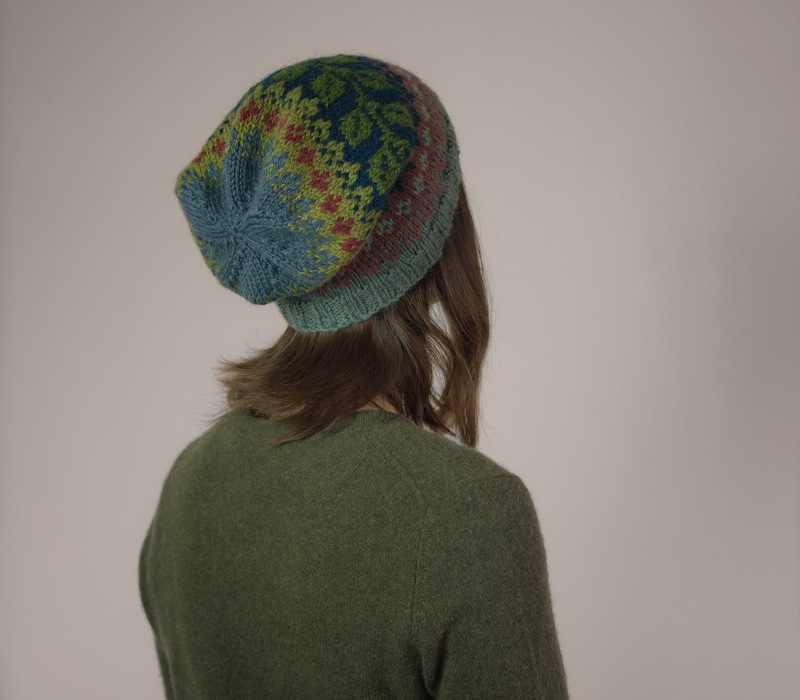 Slouchier version measures 10.25" long (26cm), shorter hat measures 9.25" long (23.5cm). Roughly 170 yards of Aran-weight yarn. I used Garnstudio's Drops Nepal. I was using up scraps and didn't measure the length used for each colour - sorry! 20 sts and 22 rows per 4" (10cm) square, knit in pattern with larger needles. 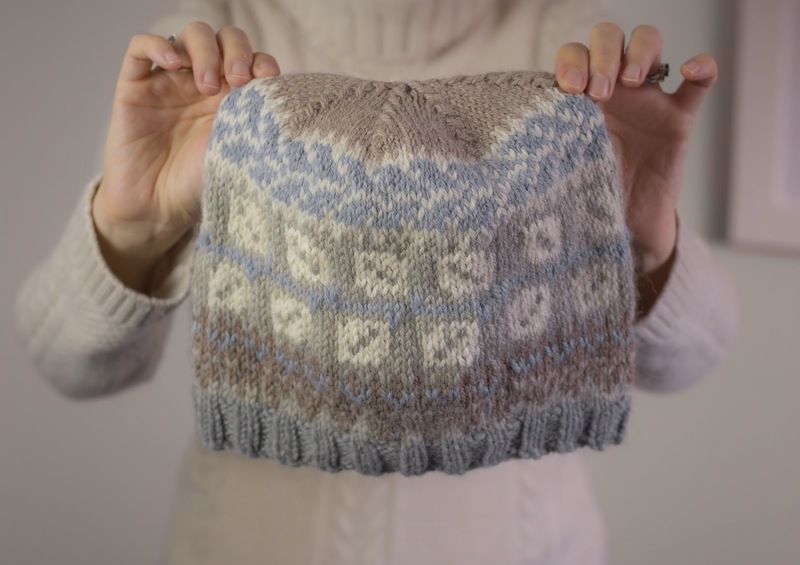 With MC and smaller needles, cast on 96 sts. Place marker and join to work in the round. Work in k2, p2 rib for 8 rounds. Next round: *M1, k12. Repeat from * to end of round. 104 sts. 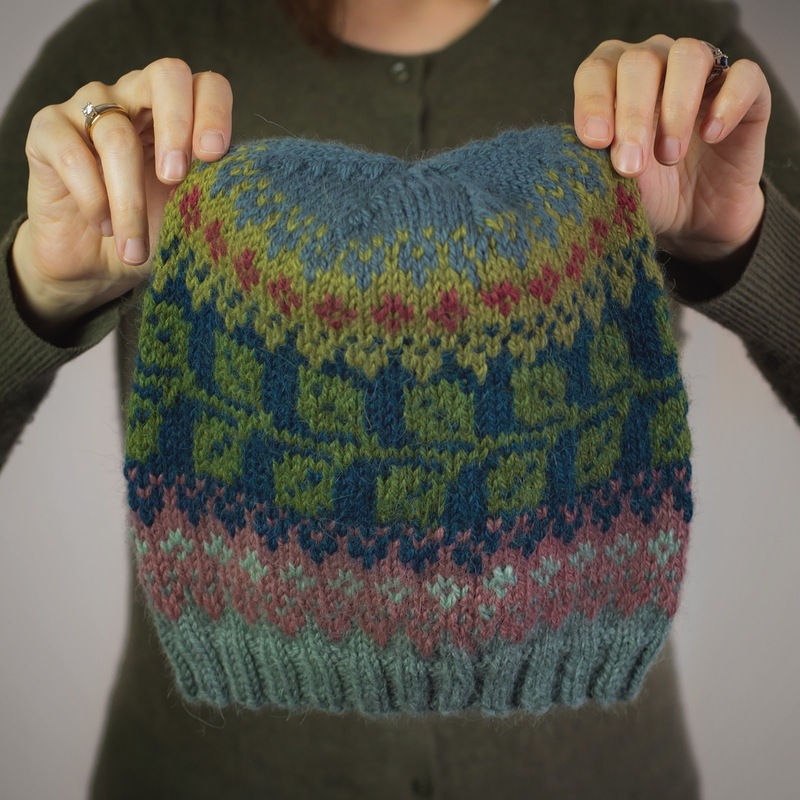 Change to larger needles and knit one round. 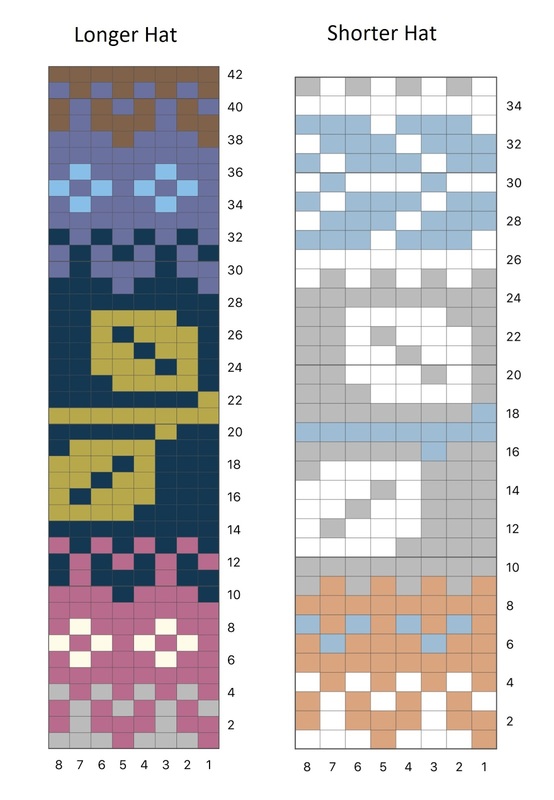 Begin working colourwork chart or your choice below. Chart is read from right to left, each 8-st repeat is worked 13 times in one round. Decrease rows to shape crown: *k10, sl, k2tog, psso, repeat from * to end of round. Remove marker, k1, replace marker. Marker has been moved over one st.
Next round: *k8, sl, k2tog, psso, repeat from * to end of round. Remove marker, k1, replace marker. Marker has been moved over one st.
Next round: *k6, sl, k2tog, psso, repeat from * to end of round. Remove marker, k1, replace marker. Marker has been moved over one st.
Next round: *k4, sl, k2tog, psso, repeat from * to end of round. Remove marker, k1, replace marker. Marker has been moved over one st.
Next round: *k2, sl, k2tog, psso, repeat from * to end of round. Remove marker, k1, replace marker. Marker has been moved over one st.
Cut yarn, draw tail through remaining stitches and pull to close opening. Sew in ends and block. Ohh Merci pour ce gentil cadeau...et deux grilles en plus.